And Then She Fell By Stephanie Laurens ~ Love.Life.Read. The only thing more troublesome than a Cynster man...is a Cynster lady who believes love is not her destiny. Famously known in London society as "The Matchbreaker," Henrietta Cynster's uncanny skill lies in preventing ill-fated nuptials - not in falling victim to Cupid's spell. But then she disrupts one match too many and feels honor-bound to assist dashing James Glossup in finding a suitable bride for a marriage of convenience. Henrietta has a knack…a knack for helping to identify the true reasons why a gentleman is pursuing a lady. Whether the reasons are for the well-meaning or the nefarious, that depends on the gentleman and the couple. When her friend asks her the reasons why James Glossup is pursuing her, she tells her the truth—he needs to marry, not because of love like she hopes. James has been put into a predicament by his best friend’s sister. Simon’s little sister Henrietta has made his nearly impossible job of finding a bride even more difficult. He has to marry but, not for devilish reasons others have had—he has to protect those on the estates he unexpectedly inherited and to do that, he has to marry by a deadline. Fate and The Lady have thrust them together when Henrietta feels compelled to help James. Imagine their surprise when the chemistry between the two them is undeniable and they find love where they least expect it to come. When their new love is put to the test, will they be able to pull through in Cynster-Glossup style or will their foe keep them apart in the end? It is no secret—I enjoy the Cynster series and this title is no exception. Henrietta and James’ story is well done and enjoyable. After figuring out fairly quickly they are meant to be together, the rest of the novel deals with the Cynster clan and their connections trying to deal with discovering who wants Henrietta killed. 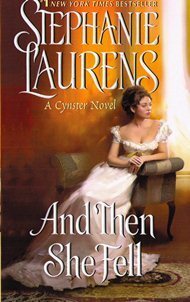 Ms. Laurens is one of the best authors to convey such a rich description of the regency time period as well as the connections between family and friends. Whether you are new to historical romance, the Cynster family or know this series inside and out—this book as something for fans of Ms. Laurens or new readers alike.